Following its successful run in London’s West End, the Olivier award winning play THE PLAY THAT GOES WRONG heads Salford’s The Lowry this week as part of its UK tour. Produced by LAMDA graduates Mischief Theatre, THE PLAY THAT GOES WRONG is farcical play-within-a-play. It follows the fictitious Cornley Polytechnic Amateur Dramatic Company as they attempt to put on ‘The Murder at Haversham Manor’, a 1920s murder mystery play similar to Agatha Christie’s THE MOUSETRAP. But as the title of the show suggests, everything that can go wrong, does go wrong and with hilarious results. As sets start to fall apart and the actors forget their lines, can the accident prone thesps battle against all odds to reach their final curtain call or will the production shudder painfully into chaos? Daft, inventive and utterly silly, THE PLAY THAT GOES WRONG is a bonkers but brilliantly funny comedy that is sure you make you laugh. The show sits in the fine tradition of British slapstick, with the talented cast delivering non-stop gags, both physical and verbal, right from the off. Even Director Mark Bell’s expertly choreographed stage mechanics and technical malfunctions are a technical triumph, ensuring that props and sets collapse right on cue. Patrick Warner delivers a fine performance as Cornley Polytechnic’s director Chris Bean, channelling John Cleese’s Basil Fawlty to a tee. Alastair Kirton is equally entertaining as Max, the novice who is delighted with every taste of audience applause. But the show’s funniest moments belong to Adam Byron as Robert with his impeccable comic timing and daring physical energy delivering the most laughs. As expected from a farce, the show relies on cheap laughs than character-based humour and to a certain extent, the audience can see what is coming. The relentless rapid-fire gags also get a little tiresome after a while and the production risks running out of steam just before its chaotic finale. That said, you cannot fail to admire the energy of the cast or the precision-drilled comedy performances they deliver. From the moment you enter the auditorium, in which a member of the audience is called up onto stage to assist with repairs to a mantelpiece, to the entertaining spoof programme which accompanies the show, there are plenty of clever laughs to be had. 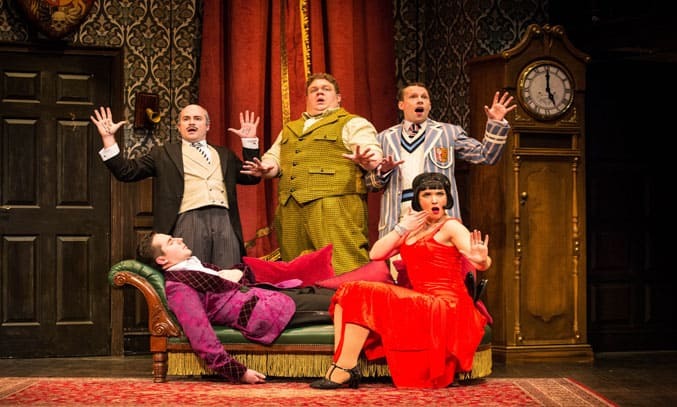 If you love a good farce, THE PLAY THAT GOES WRONG is sure to appeal and will certainly have you smiling and chuckling all night.